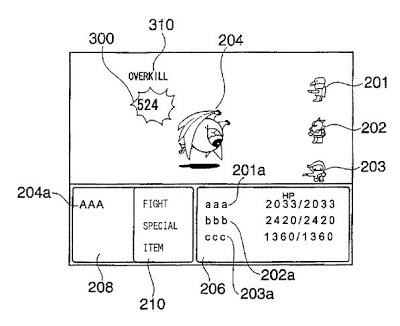 The ‘758 patent describes a video game where player is rewarded during a battle. The player is awarded points depending on actions he takes. Higher points will be awarded for killing the enemy than for an insubstantial hit during the fight. The invention also has a feature whereby the player can receive items whenever they defeat an enemy. Thus, players are encouraged to fight the enemies on each stage instead of bypassing them to complete the level sooner. Some items suggested vary from small to large medicinal items which increase the player’s health recovery depending on which item the player uses. A video game determines a reward acquired by a player character that has won a battle. If the player character inflicts damage of at least a predetermined value on an enemy character and kills the enemy character, the experience points acquired by the player character increase and the number of acquired items is also increased. If damage inflicted by the player character on the enemy character, immediately before the player character defeats the enemy character, is at least the predetermined value, then the reward of the battle is thus modified favorably for the player. 1. A computer-readable recording medium having a program of a video game recorded therein, at least one predetermined parameter assigned to a player character in said game being changed when the player character defeats an enemy character, wherein upon being read by a computer, the program of the video game causes the computer to execute: comparing an amount of damage inflicted on the enemy character by the player character, immediately before the player character defeats the enemy character, with a threshold value previously set for the enemy character; changing the parameter stored in a storage device according to a first condition, when the enemy is defeated by an amount of damage that is less than the threshold value; and changing the parameter stored in the storage device according to a second condition that is different from the first condition, when the enemy is defeated by an amount of damage that is at least the threshold value.